People join hands around Todmorden town hall in a show of solidarity against racism. Scores of people joined hands around Todmorden Town Hall in a show of defiance against a reported rise in racist incidents across the country. The event, held last Sunday, was organised to send out a clear message - Todmorden is a town which welcomes and accepts all. It’s thought around 150 to 200 people gathered at the town hall for the show of solidarity. Beth Paramor, one of the organisers, said: “It went really, really well - better than we were expecting. “It was such a positive event and I hope more things will come from it. She also thanked Emma Decent for organising a banner and Sorrel Weaver for her idea for those holding hands to pass a word around to ensure they knew everyone was there. The Mayor of Todmorden, Tony Greenwood, attended the event and spoke to those linked around the town hall. In his speech, he drew on how kindness from all walks of life helped residents of the town get back on their feet after the floods. He said: “There was a great turn out. Lots of people gathered to show, in a very original manner, that we celebrate the values of decency, cohesion and kindness. 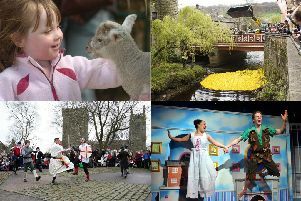 “It’s what makes Todmorden a great place to live. There could be no clearer demonstration of the town’s generous character than the public response to the Christmas flooding . “It proved the truth in the old proverb ‘a friend in need is a friend indeed’.